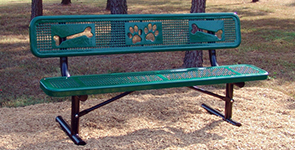 Running side by side, tossing a frisbee or tennis balls with fido, puppies and owners alike enjoy relaxing on Sit and Stay dog park benches. 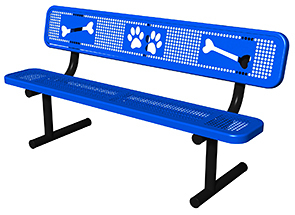 These 6' all-steel benches feature a seatback delightfully detailed with laser cut paw prints and bone designs, complementing the perforated seat and backrest styling. 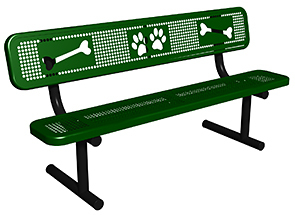 A thermoplastic coated finish safely protects the steel benches against urine, rust and fading—easily coordinating with other BarkPark® dog park site amenities.